Howdy! 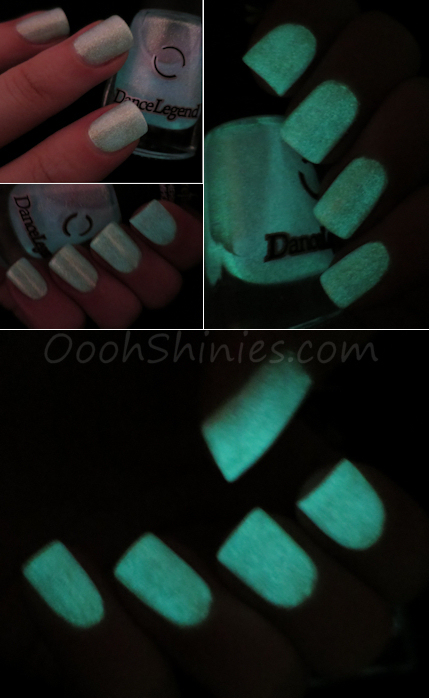 Here are 2 polishes of Dance Legend Firefly, which is a collection with 9 glow in the dark polishes. And they sure do glow! Dance Legend #9 Never Enough. Never Enough is a lilac/pink color, with strong golden shimmer. It leans more lilac or pink, depending on the angle (as you can see on my indexfinger on the above photo). I used 3 coats with top coat for my swatches, the first coat was really sheer but it gives full coverage on 3 coats. However, that first coat applied really even, so you could use this as a topper as well! Or maybe for some subtle sparkly accents? The glow in the dark effect is really strong with these, the first 2 pictures on the left show how it looked when I didn't even charge it yet, but just went from daylight to a bit darker. I'm afraid my pics ain't as sharp here, I took the auto setting on my camera, because fixing it manually took some time and I did this on a pretty warm day. I had to hide under 2 duvets to get it pitchblack... phew, warm! Needless to say, I was happy with the auto result, haha! Dance Legend #8 Price Of Beauty. Well I can repeat myself here, 3 coats with top coat, that looked very sheer yet even on the first coat. Another polish that I think will be lovely for layerings too! This muted blue base is packed with various colors microglitter. The glow in the dark effect on this one was just as strong, with a slight variation in color. Some of the colors in the collection have a different glow color though! What I noticed as well with both of them, is that the glow effect lasted pretty long. 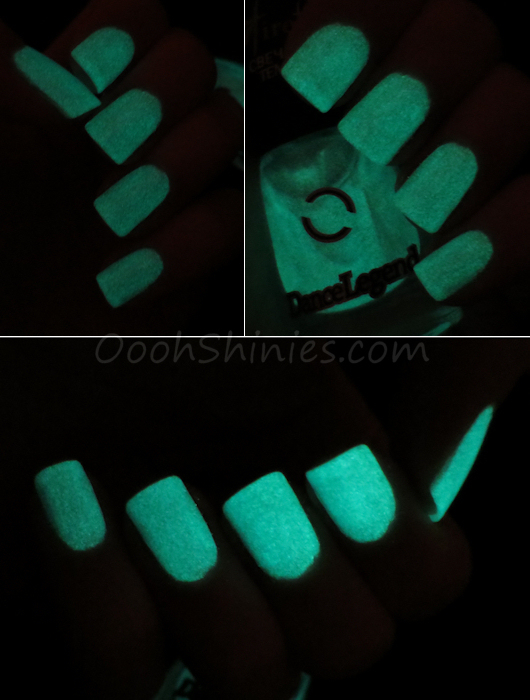 You can charge glow in the dark polish by holding it near a lightsource (I used the help light on my phone), and it'll diminish fairly quickly. But these didn't need as much light to start glowing ánd didn't diminish as fast as I've seen before, so yay for that! You can buy the Firefly collection in various webshops and of course on the Dance Legend website itself. And you can follow Dance Legend on Facebook and Instagram for more pretty polish!